Wet end components of Vanton CHEM-GARD® centrifugal pumps are injection molded of corrosion resistant polypropylene (PP), polyvinyl chloride (PVC), chlorinated polyvinyl chloride (CPVC), polyvinylidene fluoride (PVDF), ethylene chlorotrifluoroethylene (ECTFE) or other non-metallic materials that are 100% inert to the fluids being handled across the entire pH range. This eliminates the corrosion and failure associated with pumps constructed of stainless steel and other alloys, the wicking associated with fiberglass pump components and the delaminating inherent with plastic-lined metal pumps.Unlike metals (including stainless steel, Hastelloy® and other alloys) that have annual rates of corrosion, Vanton thermoplastics are inert, allowing ultrapure liquids to be transferred free of contamination. To fit virtually any new or existing application, CHEM-GARD® pumps are offered in numerous configurations including: ANSI, DIN, self-priming, close-coupled, mag-drive, combination close-coupled/mag-drive, sealless, and motor designs with integral pump shafts. 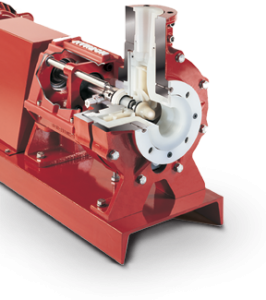 It means that a Vanton pump can meet and exceed your performance requirements, while conforming to your new or existing dimensional specifications. The wet end is comprised of solid, thick-sectioned, stand-alone components (unlike plastic linings), that are easily replaced, maximizing uptime while minimizing cost. The unique combination of advantages makes CHEM-GARD® pumps ideal for the transfer of process fluids, treatment chemicals, plant effluents and industrial or municipal water and waste streams. For transfer of slurries, stringy materials, and liquids containing solids to 2 in. (51 mm) in diameter, CG, CGA and CGC models of CHEM-GARD® pumps are available with Vortex pump heads. Every Vanton pump is fully tested to verify performance with all data permanently recorded.